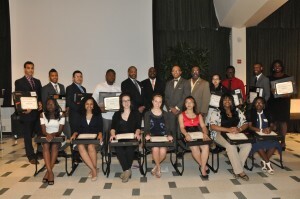 The Milwaukee Urban League held its 2014 National Achievers Society Youth Induction Ceremony on Monday, May 12, 2014 at the University of Wisconsin-Milwaukee Student Union. Area high school students recommended by adults for their academic performance, leadership skills, and community service activities are eligible for nomination as an Achiever. A highlight of the induction ceremony was the awarding of laptop computers to 15 high school seniors who will be attending college in the fall. Laptop recipients pictured with Urban League President and CEO Ralph Hollmon; keynote speaker Noah Fenceroy; scholarship sponsor Michael Barber; and Milwaukee School Board member Mark Sain include Claire Assana, Xong Chang, Roberthenry Davis, Ismael Donzo, Helen Fetaw, Meredith Gingold, Elijah Ikhumhen, Shanell Jones, Elizabeth Konkolowski, Erica Marion, Chandler Mason, Shanice McKnight, Daniel Monroy, Vanessa Morales, and Ronald Smith, III.